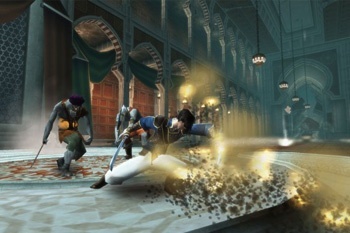 The fantastic last-generation Prince of Persia games will soon be coming to a 3D-capable PS3 near you, provided the PS3 near you is in Europe. Here's the good news: The rumored HD Prince of Persia Trilogy compilation is a real thing, and it will be hitting PS3s everywhere at the end of November. Here's the better news: The three games - Sands of Time, Warrior Within, and Two Thrones - will be given the full HD upgrade. The trilogy will ship on a single Blu-Ray disc containing 30 hours of play time (or 10 hours per game, for us mathemagicians), and will be remastered in 720p with new textures and anti-aliasing. It will even support stereoscopic 3D, to help you judge jumps more accurately (or to just make you even more motion-sick). Now, here's the weird news: As far as we can tell, this compilation is not only a PS3 exclusive, it's also a European exclusive. So while our friends in the UK can pick the compilation up for Â£29.99 (or its equivalent in Euros) on November 19th, Prince of Persia fans this side of the Atlantic are just plain out of luck. That said, I can't really imagine this being a complete European exclusive for long. Ubisoft would be foolish to go to all the trouble and not release it around the world, no? For the moment, however, we here in the States must sigh and grumble. Lousy Europeans, with their smoking and great beer and Prince of Persia compilations. What've you done for us lately, huh? Huh?